But the real focus of the party’s 32nd every-other-year leadership conference at the Grand Hotel was next year: Election 2018. That’s when every major statewide office is open. Voters in Michigan will choose a new Governor, Lieutenant governor, attorney general and secretary of state (all currently held by term-limited Republicans). The GOP will also try to unseat incumbent Democratic U.S. Senator Debbie Stabenow, and all 14 congressional races will be up for election, some expected to be competitive. If that’s not enough, voters will also elect the entire state House and state Senate in 2018. The sweltering hot weekend was a chance for political wannabes – some already well-known names, others hoping to start building recognition and reputations – to stroll the island and connect with Republicans with the means and the interest to make the trip to Mackinac. And, there was a lot of quiet chatter over how to deal with their controversial, unpredictable president. While polling suggests that two-thirds of voters overall disapprove of Trump, Republicans still seem to dig him. And they still think they’re better off sticking with him. “I think if you want to win, you want to be closer to Trump than farther away from Trump,” Michigan Tea Party leader Wes Nakagiri told It’s Just Politics. 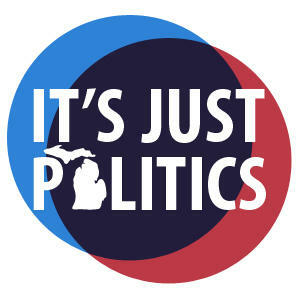 Schuette - former congressman, U.S. Senate candidate, state senator, appeals court judge, and now attorney general - is the consummate insider who makes no secret that he loves the game of politics. And loves being a candidate. “I like this. I mean, I feel liberated. It’s kind of like jumping into Lake Michigan on a hot day. I like this stuff,” he told It’s Just Politics. Schuette worked the island like it was his job. He greeted attendees at the docks as they boarded ferries to take them to the island. He roamed the hotel, meetings and receptions. He served coffee during breakfast and scooped ice cream for attendees one afternoon. Within a 24 hour period, he picked up support from former Congresswoman Candice Miller and former Michigan Governor John Engler, and emerged as the big winner in an unscientific straw poll of Republicans. All in all, It was a good weekend to be Bill Schuette. But having a good weekend on a resort island crowded with party insiders is not the same as winning over fickle Republican primary voters less than a year from now.